The near-meltdown of Fukushima, the upheavals in the Middle East, the BP oil rig explosion, and the looming reality of global warming have reminded the president and all U.S. citizens that nothing has more impact on our lives than the supply of and demand for energy. Its procurement dominates our economy and foreign policy more than any other factor. But the "energy question" is more confusing, contentious, and complicated than ever before. We need to know if nuclear power will ever really be safe. We need to know if solar and wind power will ever really be viable. And we desperately need to know if the natural gas deposits in Pennsylvania are a windfall of historic proportions or a false hope that will create more problems than solutions. 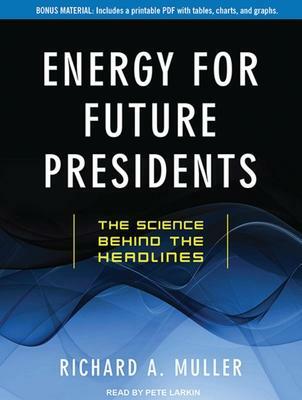 Richard A. Muller provides all the answers in this must-listen guide to our energy priorities now and in the coming years. Richard A. Muller is a professor of physics at the University of California, Berkeley, and a winner of the MacArthur Fellowship, often called the "Genius Award." Pete Larkin, an "AudioFile" Earphones Award winner, has worked in virtually all media. He was the public address announcer for the New York Mets from 1988 to 1993, served as host of WNEW-FM's highly rated "Saturday Morning Sixties" program, and has done hundreds of commercials, promos, and narrations.